The room door didn't close (lock). Room seems old (fans). Bad "save-box"
My husband and I have been on several cruises, theme park vacations with the kiddo's etc. All go go and go. This was the most relaxing vacation we've every taken. Casa Natalia was so welcoming and relaxing and the perfect romantic get away. The staff was very attentive and their hospitality made every guest feel welcomed. Our day time servers Fernando & Cesar took care of our every need, morning breakfast was superior not only the presentation the food and service was amazing. If we needed drinks or lunch at the pool side it was done with style and class. The evening bar tender Raul (one of my favorites) and you must try his personal creation summer blush, it's amazing. The evening staff at the restaurant Martin (who tried to help me with my Spanish) has a wonderful since of humor and was not only a great server but very entertaining as well. Ricardo the manager greeted every guest personally and it was like your every wish was his command. The entire staff was perfect, If we ever visit San Jose Del Cabo in the future there's only one place I would stay and that would be at Casa Natalia. Their were other staff members that unfortunately I do not remember their names and they to deserve praise for their service. Casa Natalia was pretty dang beautiful. we didn't really utilize the pool much because we stayed in the room with the private hot tub (which was incredible btw). the bar staff was super friendly, but we only had one drink since they were pretty pricey. the menu at their restaurant looked great but also cost big $$$. the free breakfast in the morning was amazing. we had to leave super early for the airport and they made sure to have ours ready when we left. i would recommend this hotel! 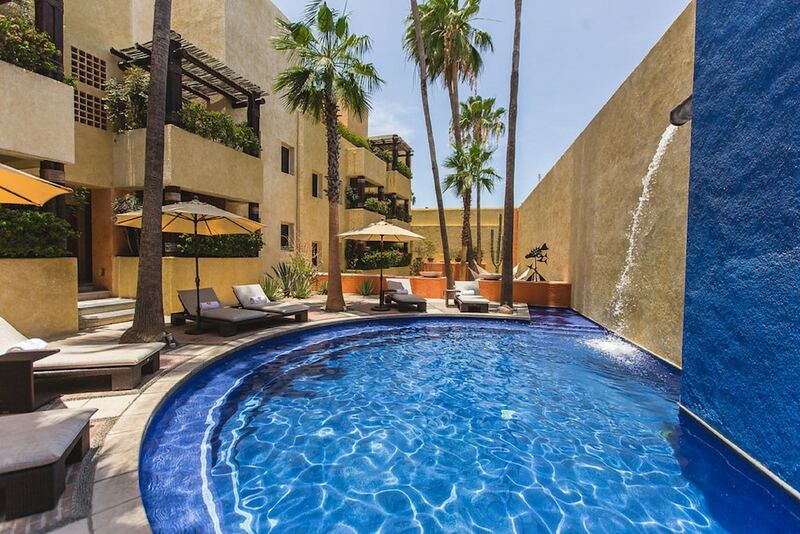 If you want an elegant, lovingly designed boutique hotel in old downtown San Jose del Cabo, Casa Natalia is it. And if you especially want to avoid the tourist nonstop party of Cabo San Lucas. We did and were rewarded. Casa Natalia has an unusual design. It steps down carefully into bar and dining areas under the stars, and girding the entire hotel's inner courtyards is a long linear fountain that gives the places the sound of running water. So you are downtown, near the historic church, for example, but you are also in a way near the beach without being at it. The linear fountain ends in a semi-circular pool, just perfect for refreshment, with a tall spout of water perfect for a natural rubdown! The staff are very friendly, expert in English as well as other languages, and the owner Natalie herself conversant in Spanish, German, French, as well as English. She is quite gracious and brought to her dream hotel many years' experience with the larger chains. The restaurant Mi Cocina gives delicious, carefully prepared dishes. Thoroughly enjoyed our stay. The room was clean and tastefully decorated with comfortable furniture. The food at Mi Cocina was outstanding. I HIGHLY recommend the Tuna tataki (LOL.....I had four orders over 3 days!). Cesar and staff bent over backwards to make sure we were well cared for. We will certainly stay here again. Our room was right over the lobby. We heard a lot of talking from staff in the lobby area starting at 6 am. Very clean and quiet hotel in an area of several shops and eateries. The staff was very accommodating and polite. Check in and check out was a breeze. We would highly consider staying here again should we return to the area. The hotel and website is lovely. The gentleman, Cesar that checked us in was great and very helpful. The Oyster Bar chef was very creative and very engaging. But I'm afraid it ended there. The parking is a total nightmare. Twice had to go down two one-way streets the wrong way just to get to the parking lot that is a block away... Streets were blocked off and there was construction on the road to drop off the luggage and pick up a pass for parking.......then you had to go around and around again. The all around service of the restaurant was very poor and so was the food we ordered at the restaurant. But again, the Oyster Bar was great!! For the price we paid, there was no breakfast included. Nor is there a coffee maker in the room. So either you had to pay for someone to bring you coffee in the morning or you had to get up and get dressed and go into the lobby to the bar to get a tasteless (small) cup of coffee. Who wants to do that on vacation?? Not only that but at 6:00 am loud music was playing in the public spaces directly feeding into our room. The internet reception was poor in our room. The hot water in the shower did not work, so once again you had to get dressed and go into the lobby to have someone come and fix it. There were no phones in the room to access the desk for help.o Overall we have a negative view this Hotel based on the pricing. To make matters worse, when I went on line to book and saw one price, but paid $30 more,. Perfect central location right on the main plaza. Small boutique hotel with Mexican handicraft decor and uniquely themed rooms. Nice private patio with hammock. All rooms look onto pleasant central courtyard with "stream-fed" pool. Unfortunately the bathroom lacks privacy. No doors on bathroom or shower. Toilet enclosure is semi-transparent with small semi-transparent windows that open to the public sidewalk only feet away. Same type of windows in shower. Strange! My husband and I ended up here by the true grace of God. We were leaving for our honeymoon and we got an email that our hotel was closing for a tropical storm coming into Los Cabos. Luckily we were able to find a hotel willing to take us in on short notice. As soon as we got there they were were amazing. We got there a bit early but they rushed and got our room ready. That night the storm was supposed to hit again and they made sure we ate dinner and felt safe before they closed up for the night. The food was amazing, the staff was so kind and made us feel extremely welcome and San Jose made me feel right in Mexico with all of the art and architecture. We have promised each other to go back again and refuse to stay anywhere else! I highly highly recommend!!! Really quite hotel located in the art walk. In cabo, it gives you the chance to explore local scene and get to know the culture a bit. I love the street in which it is located. After partying hard in cabo, we stayed here for a quiet night. Our stay at Casa Natalia was so wonderful! The hotel feels cozy, quiet and very private! The age restriction is 13 and up so there were no kids screaming and splashing at the pool. It is a perfect adult getaway! The rooms are comfortable and we loved the private patio with hammock! The hotel staff are also amazing! Friendly, courteous and accommodating to special requests. Especially helpful were Eduardo and Mayli at the front desk who helped us find our way around on the bus! The food was excellent although we found it a bit pricey for our taste, however there are plenty of restaurants close by to choose from. There are only two cons and they are not deal breakers by any means: but the safe is really small and barely fit my travel wallet. It's round and shaped like a cannon barrel. Deep but not wide enough for very much. The area feels very safe though so we weren't too terribly concerned. The other is that we would have liked a small fridge in the room. We drink a lot of water and there was nowhere to keep it cool. All in all, these cons are very minor! We enjoyed our stay at Casa Natalia and we would definitely stay there again. This was our second stay at Hotel Casa Natalia and again it was wonderful. Food great, staff very attentive but not intrusive, and help with arranging side trips much appreciated. Really fun to walk around town--every day my husband brought breakfast from the French Bakery nearby. Highly recommended for those who want a low-key vacation. This small hotel is really delightful on the Plaza in Downtown San Jose del Cabo; where there is always something going on. It is located on the edge of the art district. Service is impeccable; the rooms are clean and cheerful. Breakfast can be served on your individual pateo and is a great way to start the day. The pool is small but a great addition when it is hot! The hotel has an excellent restaurant and bar, and yes its true its not on the beach but they do provide access. Excellent customer service and excellent restaurant located inside! Best food ever! Location is perfect. Only 30 minutes from downtown and near to beach and activities. The buses are frequent and the ride is peaceful and scenic. Most relaxing vacation spot ever. Book now! I will definitely return next year! Like they say on their website, casa doesn't mean "house" but "home". Wonderful location to be during the holidays. Right on the plaza of San Jose del Cabo. Art Walk Thursdays....great time. All kinds of restaurants nearby. Shopping everywhere. Hospitality at Casa Natalia was like living with family. Friendly comfortable family. Sit out in the square and watch a Mexican community unfold. Our stay at Casa Natalia could not have been better. The hotel is perfectly located in San Jose Del Cabo. The staff at the hotel is outstanding. They went out of their way to be helpful. In addition, they have a highly rated restaurant that is situated in a lovely and cozy courtyard, it is a very romantic setting for a special dining experience. We would not considerstaying anywhere else upon a return visit to the this area of the Baja peninsula. Very nice and comfortable. The staff is friendly and they were very helpful. The only negatives were is we had warm water in the shower not hot, and the restaurant was okay, but in my opinion if your going to spend the money go to Morgans or Don Sanchez. Located in Downtown San Jose del Cabo, Casa Natalia is adjacent to Mission of San Jose with other popular attractions like Puerto Los Cabos within a couple of miles (3 km). This 18-room, 3.5-star hotel has an outdoor pool along with free in-room WiFi and free self parking. This hotel serves as home to a bar, along with a restaurant that specializes in international cuisine. Order from room service to satisfy your hunger without leaving your room. Full breakfast is offered for a fee each morning from 7 AM to 11 AM. A flat-screen TV comes with cable channels, and guests can stay connected with free WiFi. Select Comfort beds sport Frette Italian sheets and the bathroom offers a hair dryer and free toiletries. Other standard amenities include a furnished balcony or patio, a sitting area, and free local calls. Casa Natalia features an outdoor pool, free WiFi in public areas, and a business center. You can take advantage of free parking, along with an airport shuttle (available 24 hours) for USD 120 per vehicle roundtrip. The front desk has multilingual staff that can help with luggage storage and concierge services. Other amenities at this boutique hotel include a computer station, express check-in, and express check-out. the perfect get away from the everyday busyness! Woww! Muchas gracias for taking the time to write this very special comment about your experience at our Casa Natalia & Mi Cocina. So happy you enjoyed it and MUCHAS GRACIAS to say all the beautiful things about your stay and we will share your review with our staff as they are always an important part of our family. Look forward to welcoming you again very soon, and guests like you give us the strength to go on ... Saludos! Thank you so much for your review and for sharing your experience at our 'Casa', we are happy to know that you enjoyed your stay with us. Look forward to welcome you back in a near future! nice hotel in the art district. Thank you very much for your feed back and for having stayed at our 'Casa'. We have taken note about the staff talking early morning and will make sure it does not happen once more. We all at Casa Natalia look forward to welcome you back in a near future! Mi Cocina & Baja Oyster - Restaurant and bar specializing in international cuisine. Open select days for breakfast, lunch, and dinner. Alfresco dining available (weather permitting). Reservations required. Palapa Bar - Restaurant and bar specializing in international cuisine. Open select days. Alfresco dining available (weather permitting). Reservations required. Recreation features at Casa Natalia include an outdoor pool. The preferred airport is San Jose del Cabo, Baja California Sur (SJD-Los Cabos Intl. ): 23-min drive, 8.7 mi/14 km. The front desk is available during limited hours, and checking in and out are easy with express services. For convenient arrivals and departures, you can take advantage of the airport shuttle (available 24 hours), which is offered for a fee. Driving? This property offers free parking. This property's front desk is open daily until 11 PM. Guests with plans to arrive after 11 PM must make arrangements in advance by contacting the property using the information on the booking confirmation. Casa Natalia is listed in the 2015 Condé Nast Traveler Top 100 List. Presidential Suite at Grand Solmar Lands End Resort. Week 52 Available!